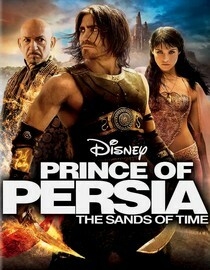 The king of Persia sees a daring and courageous young orphan in the market and decides to adopt him as his son. As a young man, Prince Dastan (Jake Gyllenhaal) helps his brothers to strike the holy city of Alamut in the search for treacherous invaders, but during the invasion, the beautiful princess Tamina, the guardian of the Sands of Time, tries to smuggle out a dagger that holds mysterious powers and the dagger ends out in Dastan’s possession. When the king is poisoned with a robe that Dastan has presented as a gift, everyone assumes Dastan has committed treason so he flees to save his life. Princess Tamina joins him in his quest to clear his name and ultimately restore balance to the world through the frequent use of the magical dagger. The story is somewhat boring, but lush scenarios and costumes, as well as good performances by Ben Kingsley and Alfred Molina make this movie worth your time.